Long before MP3s, iPods, downloads, streaming audio, and playlists, an entire generation of kids grew up making and listening to Mix Tapes. The cassettes were small, convenient, and easy to carry from the car to the party. They also sounded great for how small they were, which lent well to the Sony Walkman players we all had. And if the tape got trashed or a crazy ex-girlfriend took it, it was easy to just record a new one. I was part of the battalion who recorded their LPs onto cassettes, as a way to keep from wearing out the records. I also worked hard to create that perfect blend of songs that would capture and then prolong a mood. In a way, making a mix tape back then was like an art form. Recording both sides could take two hours or more, depending on how much care went into the mix. I considered many of my mix tapes to be crafted works, because I put a lot of thought into choosing what song should come after the one that just ended. I wasn’t one to just chuck a bunch of stuff together. The mood had to flow. Sadly, the ability to put a human touch on that smooth movement from one song into another is now lost to technology. Of course, playlists can be created to compile songs under one genre or keyword, but that only goes so far. Finding the nuances, the delicate similarities, and emotional ties of two songs just doesn’t happen in a CPU. I have yet to find a current technology that allows me to mix mood like I did on a tape back in the day – one song at a time in a layer that will build the emotion and carry it to the end. Maybe it’s time to just go back to making tapes. I found the above cassette in 2011 when I was putting away some baseball cards. 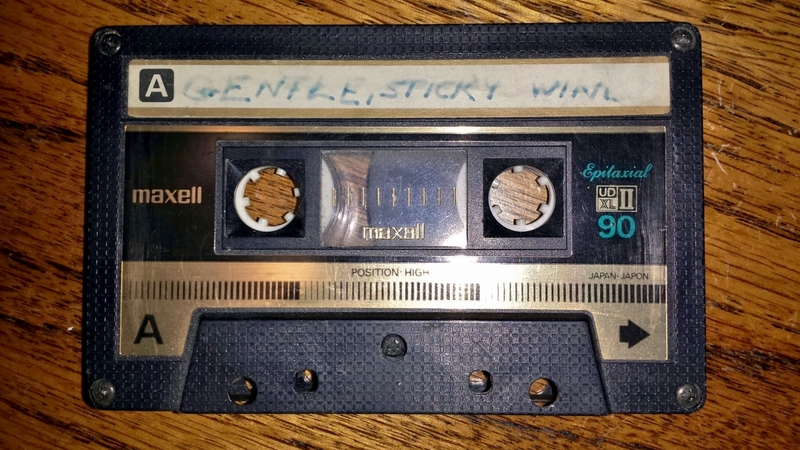 Gentle Sticky Wind was created around 1986 as a mellow mix tape, using a Maxell UD II High-Bias 90-minute cassette – the best-sounding tape I could buy. This one still plays great – twenty-five years later. GSW was mixed on Side A only, using tracks from my record collection; Queen’s 1978 release News Of The World was put on Side B, recorded from a 25-cent LP I picked up at Cellophane Square in 1985 (I still have that LP). While I’m not certain why I wanted to create a slow sorrowful mix tape that day 25 years ago, I suspect it had something to do with a relationship that had recently ended. That aside, I managed to blend Genesis, Nick Kershaw, KISS, George Benson, and a couple of surprises onto a side of slow mellow songs that pulled every ounce of emotion out of my album collection. When I listened to it earlier today, the memories of mixing it down popped out of the dusty edges of my brain – reminding me of how much work I put into choosing each song to share a mood with the previous one. Making a mix tape was fun, even if it wasn’t very simple. There was a lot to think about and to coordinate. I had to be in control of two very-different pieces of equipment: the turntable and the tape deck. My weapons of choice: Technics Direct-Drive Turntable (still have it), Realistic 100-watt receiver (RIP), and an Audiotechnica Cassette recorder that I bought for $50 in the Bargain Basement at the SODO Sears Store (now Starbucks HQ). The first song was always the most important, because it set the mood. Every song after that somehow related to the first. I would often just start with Track 1 / Side 1 of an LP, because record companies started their albums with something catchy. While the recording commenced, I would look through my record collection for the next song – all the while making sure the recording levels on the cassette deck wouldn’t “peak” and saturate the tape. When the track was done recording, I would pause the deck, swap the album and find the track I wanted. Then I would stage the track by finding the beginning and then turning the record back by 1 ½ rotations. I released the record, then released the deck’s pause button at ¼ turn before the song started. Bam. Done. Repeat. Doing that over and over made the process smoother than it sounds. 1. Play The Game by Queen – Track 1 Side 1 on Queen’s 1980 release The Game worked perfectly for this. Soaring harmonies and solid talent. Straight up. 3. Beth by KISS – Blending this song with Sister Christian was really fun, and not quite as easy as it sounds. The timing for the note had to be perfect. I think I got it right on the third try. Still made me smile today when I heard it again. Find it just after the 8:20 marker on the MP3. This is the quietest KISS song ever; from their 1976 release Destroyer, it was followed on the album by the raunchy final track Do You Love Me. 4. Wouldn’t it Be Good by Nik Kershaw – Borrowed this from a friend. Cute track, very 80s. I goofed the beginning of the track a bit, and it comes in too strong. But during the recording I backed off the levels. 5. Only You by Yaz – Had no idea who they were, but at the time I was stopping by radio stations and taking their bins of discarded Demo records home. This was probably one of them, and I probably still have it somewhere. 6. Spellbinder by Foreigner – Classic rock slow-song goodness. One of my favorite early Foreigner tracks. Lou Gramm could sing a grocery list and make it sound like a hit. 7. I’m Always Gonna Love You by Gary Moore – Awesome 80s rock ballad, courtesy of Irish guitarist Gary Moore. He had a long career, starting in 1969 and eventually gaining fame with Thin Lizzy and on the solo circuit. He opened for Rush at the Tacoma Dome in 1984-85, and blew the Dome away. He recently died of a heart attack while on tour in Spain. Rest In Peace, Gary. 8. Fade Away by Bad Company – Obscure final track off 1976 album Run with the Pack. Bluesy and heartfelt. Interesting effects on Paul Rodgers’ voice. 9. Take Me Home by Phil Collins – A coworker said this evening, “If that was an 80s mix tape, I’m pretty sure there was Genesis on it.” He was nearly right; I added this solo work from Phil. 10. Unchained Melody by George Benson – From the 1979 release Livin’ Inside your Love, this album was in a collection I found in a dumpster behind a record store, along with a copy of The Beatles White Album. This cover of Unchained Melody, while kind of long, is one of the smoothest I’ve ever heard. I could listen to George Benson’s voice and guitar licks all day long. I really enjoyed re-finding Gentle Sticky Wind; in fact I loved it so much that I decided to digitize Side A of the tape. But I didn’t digitize the tracks individually, rather I recorded Side A as a single 45-minute track before converting it to MP3. Now I have the 21st equivalent of a mix tape, because I can pause, rewind, or go forward on the MP3 – just like I could on the cassette. For the record (no pun intended), it’s a mix best played after hours. Anyone who wants experience Gentle Sticky Wind for themselves, in glorious Mono, can get it at these links below. May Gentle Sticky Wind glue you to the 1980s. Enjoy!